CakeSpy Note: Remember that amazing "So You Wanna Be a CakeSpy?" Contest? Well, with the winner's trip to Seattle coming up, I thought I'd take some time to focus on several of the finalists and profiling them and their recipes. 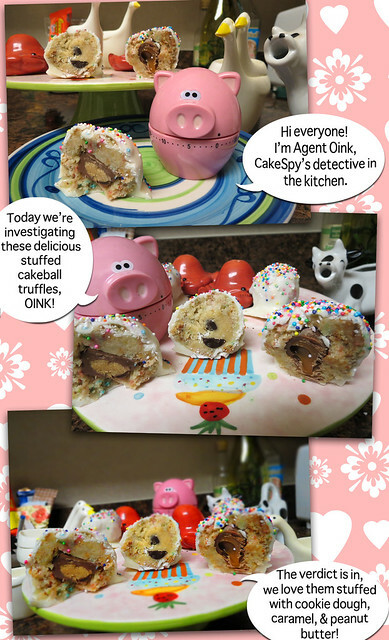 Let's get to know Allyson Dwyer and discover her recipe for Stuffed Funfetti Cake Ball Truffles! What does being a CakeSpy mean to you? Being a CakeSpy means keeping your eyes open for the most unique and interesting of baked goods, and making sure to try them! I'm always super excited to find and make things that I think to be new flavors that totally change what you think baking can be. Like cookies that have fruity pebbles in them in NYC, or vegetable flavored ice cream in Baltimore, or a garam masala scone at my favorite bakery in NJ. Finding these things, plus making your own versions, is being a CakeSpy! How did you come up with your amazing dessert entry? Going along with my CakeSpy philosophy, that is how I dreamt up enhancing one of my favorite treats: cakeballs. My friend introduced Red Velvet cakeballs to me, and ever since she told me how to make them, I have make many versions like pistachio, vanilla, orange, halloween-themed. They are so much fun to make! And stuffing them with a surprise in the center seemed like the next logical step to making them even better. Cake or Pie? I have always been a cake person. Cake is so versatile, it can be so many flavors both within the cake, and the frosting, what you put in the layers or on top. Pie is delicious but its form doesn't all low for all the change cake does. Plus, I have more fun making a huge decadent cake for special occasions. What would your "last meal" dessert be? Either my family's recipe for Irish Soda Bread with marmalade on top, or something from my favorite bakery of all time, The Flaky Tart, in Atlantic Highlands NJ. They have the best cinnamon buns, the best muffins, the best scones and brownies and pastries. They can't be beat and I can eat myself to death with their amazing treats! Make cookie dough in advance: cream butter with sugar, and add egg, and extract. Add dry ingredients until well combined, and fold in chocolate chips. Let chill in the fridge for a while because it will be easier to work with. Bake cake as directed for your funfetti. While cake is baking, make frosting by combining sugar and butter, and adding the vanilla and cream and salt until combined and fluffy. When cake is done in oven, let cool completely. When cake is cooled, crumble with hands, and spoon in tablespoons of frosting at a time and stir. You will have to use your hands to fully combine the two, but do not add all the frosting because you do not want it to be mostly frosting. Prepare a baking sheet and place a piece of wax paper, and set out your items for stuffing the cakeballs. Then (and you can eyeball the amount) scoop up a small amount of cake/frosting mixture and form half a circle. Then you can place anything you with (such as a small chunk of cookie dough, rounded out, or peanut butter cup) within. Then pick up more cake/frosting mixture and cover completely. Make sure shape looks round, and place on the baking sheet. Once done, place the baking sheet in the freezer for an hour or two. Once at a cold, solid temperature, melt white chocolate. Dip frozen cakeballs in the chocolate, making sure to let excess come off, and place back on baking sheet/wax paper, and throw some sprinkles on! Place in fridge to let chocolate settle, and that's it!